The Queens Library this week unveiled the new location for its Archives and launched the Digital Archives website that pledges online access to more than 12,000 items from the QL collection. The Archives has moved down to the lower level of the Central Library in Jamaica from its second-floor space. On Tuesday morning, Library President and CEO Dennis Walcott, elected officials, library staff, Queens historians and members of the community toured the new location, which features climate-controlled storage to better preserve the thousands of valuable items that document the social, economic, and political history of the four counties on Long Island: Kings, Queens, Nassau, and Suffolk. “These archives…are an opportunity to learn from the contributions of others,” said City Councilman I. Daneek Miller (D-St. Albans). 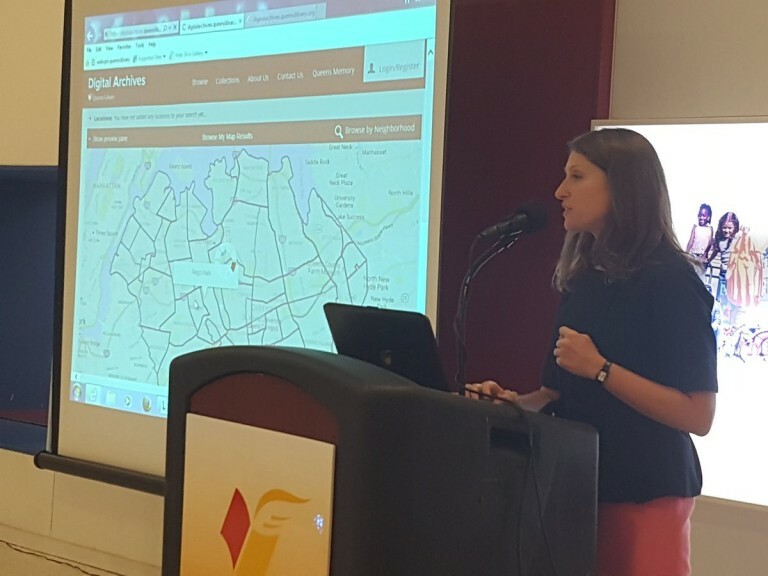 The Library describes its Digital Archives as “the online repository” for selected maps, photographs, manuscripts, newspapers and books documenting Queens, Brooklyn and greater Long Island (Nassau and Suffolk counties). “The site is constantly growing to provide researchers from around the world with expanded and enhanced access to the Library’s local history collections,” according to QL. For example, Forum staff browsed the Newspapers and Periodicals collection (naturally). Almost immediately we were afforded access to editions of the Corona/East Elmhurst Transition Press from the 1970s, issues of The Wave of Long Island from the late 19th Century. “There are so many people in Queens with so many personal stories, and journeys,” added State Sen. Leroy Comrie (D-St. Albans). The Project combines historical and contemporary photography, maps, news clippings, and other documents with oral history interviews of current “World’s Borough” tenants. The Memory Team needs you to help create and maintain the projects digital archives by contributing memories, photos and stories. According to the Library, project coordinators want to know about your life in Queens now and in years past, so it can be documented and preserved for future generations. Did you emigrate from another country? What did you experience? Do you have photos of your neighborhood from years ago? What was your school or your children’s school like? Library customers are invited to bring in their family photos, documents and other memorabilia. Staff will digitize the materials on-site and return them the same day. Customers with receive a free flash drive containing the digital copies of their materials. The scanned images become part of the Queens Memory website and will be shared with the Digital Public Library of America. “Many items that can help add to the history of Queens are sitting in closets and basements all over our borough,” said Joanne King, recently retired director of Communications at the Library.